When Punit and Carla commissioned 6 of Four for their wedding, we just knew we were in for something special. Carla, who’s family is Nicaraguan, and Punit, who is Indian were blending their culture and traditions on their celebration weekend. Instead of the typical fusion style wedding that has one day of either one of the cultures dominating most of the day or a blended ceremony, they decided to have two separate days to devote fully to each culture. We are always honored to be given the opportunity to capture couples from varying backgrounds. It is part of their heritage, and quite an honor to capture. Then, it will inevitably become an heirloom, part of their family forever. So here we are on day one! Day one celebrates the deep rooted Hindu traditions in Punit’s family. With Katie being very pregnant, I was very fortunate to have a good friend and colleague in the wedding photography industry, Andrew Niesen give me a hand both days. 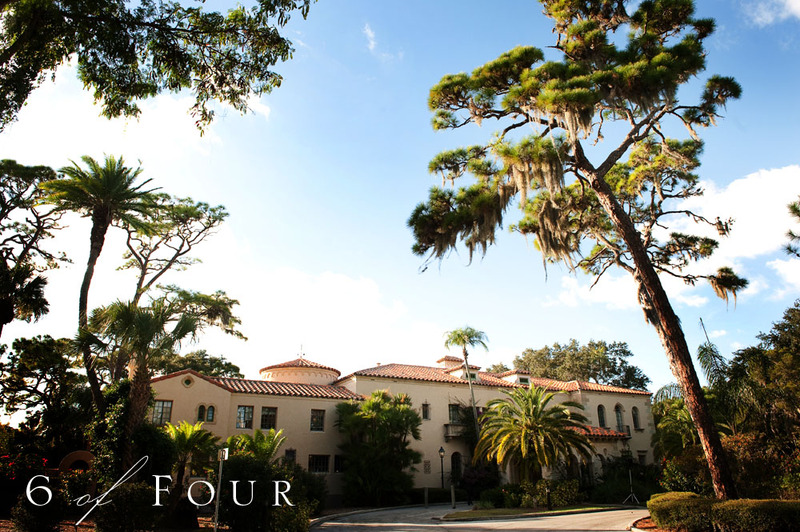 The Indian celebration took place at the beautiful Powel Crosley Estate, in Sarasota, Florida. This gorgeous estate with its Spanish tiled roof, is rich in history and is nestled along Sarasota Bay lending to gorgeous photographs all day. 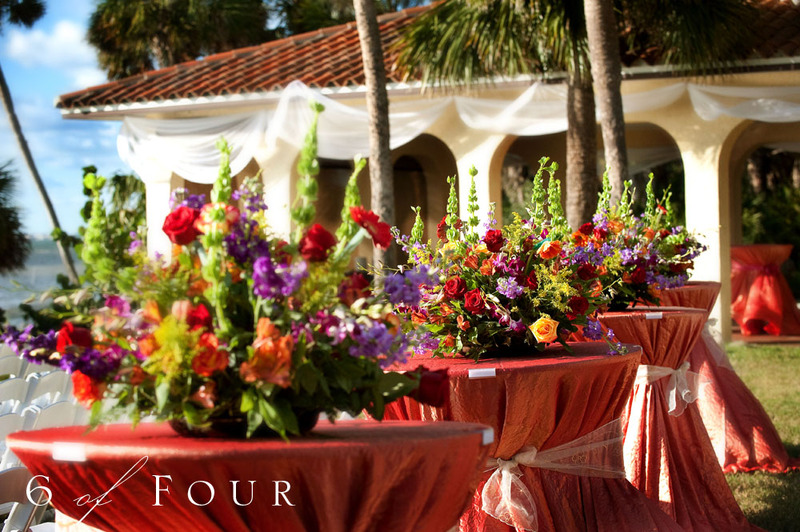 The floral arrangements were a beautiful array of colors and detail created by Palloo’s Flowers. They just did perfect to high light special parts of the estate. Carla just looks absolutely stunning while waiting for her groom to arrive. I love her sari, as it’s colors are not the traditional red and white, but rather a deep red & green sari with beadings of gold and accent colors. Punit on his white horse during the Barat. What a celebration this was! From the sound of the dohl and the dancing, it was just electric! As the barat approaches, Carla’s family awaits their arrival with the priest. I love that Carla’s dad, the man clapping wants so badly to be part of the celebration. This the first time that Carla got to see Punit all day. As the veil was lifted to see her eyes light up was just exciting. To see the connection they had through out the ceremony was intimate and close to them. As they were at this part of the ceremony the sun was setting over the bay and the sky light could not have been better. The couple….need I say more? Their reception outfits were just as colorful and festive as the reset of the evening. Their first dance took place in the back of the mansion in the beautiful courtyard. With the black of night, we were fortunate to have the lighting direction by Bay Stage Lighting. A special surprising entertainment the bride and groom had for all the guest were the fire performers, Pyro Fusion. The guests had a wonderful time during the reception. DJ Gaurav did a great job keeping it lively and the energy high. Keep checking back for day two! great pics . Wow ! Just beautiful. The colors are vibrant and amazing. You captured the color and emotions of the ceremony so vividly…amazing photos. Absolutely beautiful guys! So vivid!! !